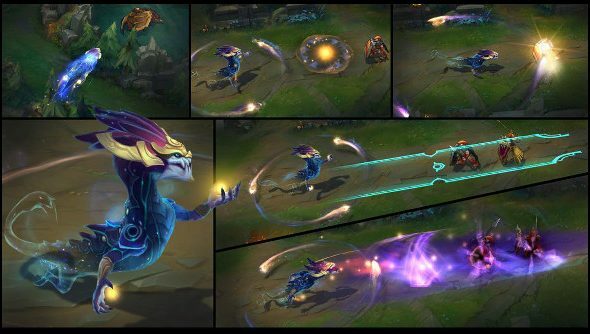 The next League of Legends champion is a giant space dragon called Aurelion Sol, because all sense of scale in MOBAs has now been lost. While this godlike being can look forward to getting beaten by, in turn, a psychopathic dwarf with a mushroom fetish, a bear dressed like a police officer and pretty disgruntled nurse, he does still manage to be pretty rad despite the power-drop from his sun-destroying lore. Climb aboard the dragon hype train with our list of the best League of Legends champions for beginners. When he was first revealed, I was a little disappointed in Aurelion’s abilities. They seemed a little basic, not flashy enough, and his ultimate specifically was quite the let down after the weirdness of the rest of his kit. I’ve flipped on that now, as he looks like a tonne of fun andI’m a big fan of how little he seems to need to attack. With the way League’s stat-ups work, giving you direct ability damage, it’s far more important that he nail his orbs than basic right-clicks. The lack of an escape makes him very vulnerable, but the ability to gank anywhere on the map with ease could push him into competitively viable. I do worry that skilled opponents will find it fairly easy to dodge his orbs, but in the madness of a teamfight they’re going to be hitting someone. Exactly when he’ll be released isn’t confirmed, though the appearance of a spotlight video usually means the champion included is little more than a couple of weeks out. His patch, 6.6, was released just a few days ago. For more on the giant taily one, check our how to play Aurelion Sol guide.